This article is about the book of the New Testament. For St. Ignatius of Antioch's letter to the Romans, see To the Romans. The Epistle to the Romans or Letter to the Romans, often shortened to Romans, is the sixth book in the New Testament. Biblical scholars agree that it was composed by the Apostle Paul to explain that salvation is offered through the gospel of Jesus Christ. It is the longest of the Pauline epistles. In the opinion of Jesuit scholar Joseph Fitzmyer, the book "overwhelms the reader by the density and sublimity of the topic with which it deals, the gospel of the justification and salvation of Jew and Greek alike by the grace of God through faith in Jesus Christ, revealing the uprightness and love of God the Father." ...neither a systematic theology nor a summary of Paul's lifework, but it is by common consent his masterpiece. It dwarfs most of his other writings, an Alpine peak towering over hills and villages. Not all onlookers have viewed it in the same light or from the same angle, and their snapshots and paintings of it are sometimes remarkably unalike. Not all climbers have taken the same route up its sheer sides, and there is frequent disagreement on the best approach. What nobody doubts is that we are here dealing with a work of massive substance, presenting a formidable intellectual challenge while offering a breathtaking theological and spiritual vision. The scholarly consensus is that Paul wrote the Epistle to the Romans. The denial of Paul's authorship of Romans by such critics ... is now rightly relegated to a place among the curiosities of NT scholarship. Today no responsible criticism disputes its Pauline origin. The evidence of its use in the Apostolic Fathers is clear, and before the end of the second century it is listed and cited as Paul's. Every extant early list of NT books includes it among his letters. The external evidence of authenticity could indeed hardly be stronger; and it is altogether borne out by the internal evidence, linguistic, stylistic, literary, historical and theological. 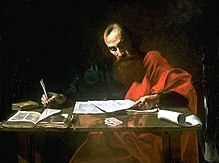 A 17th-century depiction of Paul writing his epistles. Romans 16:22 indicates that Tertius acted as his amanuensis. The letter was most probably written while Paul was in Corinth, probably while he was staying in the house of Gaius, and transcribed by Tertius, his amanuensis. There are a number of reasons why Corinth is considered most plausible. Paul was about to travel to Jerusalem on writing the letter, which matches Acts[Acts 20:3] where it is reported that Paul stayed for three months in Greece. This probably implies Corinth as it was the location of Paul's greatest missionary success in Greece. Additionally, Phoebe was a deacon of the church in Cenchreae, a port to the east of Corinth, and would have been able to convey the letter to Rome after passing through Corinth and taking a ship from Corinth's west port. Erastus, mentioned in Romans 16:23, also lived in Corinth, being the city's commissioner for public works and city treasurer at various times, again indicating that the letter was written in Corinth. The precise time at which it was written is not mentioned in the epistle, but it was obviously written when the collection for Jerusalem had been assembled and Paul was about to "go unto Jerusalem to minister unto the saints", that is, at the close of his second visit to Greece, during the winter preceding his last visit to that city. The majority of scholars writing on Romans propose the letter was written in late 55/early 56 or late 56/early 57. Early 55 and early 58 both have some support, while German New Testament scholar Gerd Lüdemann argues for a date as early as 51/52 (or 54/55), following on from Knox, who proposed 53/54. Lüdemann is the only serious challenge to the consensus of mid to late 50s. προς Ρωμαιους εγραφη απο Κορινθου δια Φοιβης της διακονου της εν Κεγχρεαις εκκλησιας ("to the Romans it was written from Corinth by Phoebus the deacon of the church in Cenchreae"): 101, 241, 460, 466, 469, 602, 603, 605, 618, 1923, 1924, 1927, 1932, followed by Textus Receptus. For ten years before writing the letter (approx. 47–57), Paul had traveled around the territories bordering the Aegean Sea evangelizing. Churches had been planted in the Roman provinces of Galatia, Macedonia, Achaia and Asia. Paul, considering his task complete, wanted to preach the gospel in Spain, where he would not "build upon another man’s foundation". [Rom 15:20] This allowed him to visit Rome on the way, a long-time ambition of his. The letter to the Romans, in part, prepares them and gives reasons for his visit. In addition to Paul's geographic location, his religious views are important. First, Paul was a Hellenistic Jew with a Pharisaic background (see Gamaliel), integral to his identity: see Paul the Apostle and Judaism for details. His concern for his people is one part of the dialogue and runs throughout the letter. Second, the other side of the dialogue is Paul's conversion and calling to follow Christ in the early 30s. It is established that there were Jews living in Rome in the times of the Apostles, and that those Jews who had believed [in Christ] passed on to the Romans the tradition that they ought to profess Christ but keep the law [Torah] ... One ought not to condemn the Romans, but to praise their faith, because without seeing any signs or miracles and without seeing any of the apostles, they nevertheless accepted faith in Christ, although according to a Jewish rite. The occasion of writing the epistle: ... Paul had made acquaintance with all circumstances of the Christians at Rome ... and finding that it was ... partly of heathens converted to Christianity, and partly of Jews, who had, with many remaining prejudices, believed in Jesus as the true Messiah, and that many contentions arose from the claims of the Gentiles to equal privileges with the Jews, and from absolute refusal of the Jews to admit these claims, unless the Gentile converts become circumcised; he wrote this epistle to adjust and settle these differences. 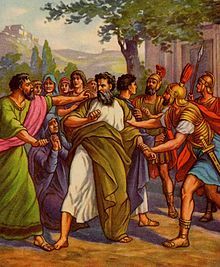 Many of the brethren went out to meet Paul on his approach to Rome. There is evidence that Christians were then in Rome in considerable numbers and probably had more than one place of meeting. Note the large number of names in Romans 16:3–15 of those then in Rome, and verses 5, 15 and 16 indicate there was more than one church assembly or company of believers in Rome. Verse 5 mentions a church that met in the house of Aquila and Priscilla. Verses 14 and 15 each mention groupings of believers and saints. Jews were expelled from Rome because of disturbances around AD 49 by the edict of Claudius. Fitzmyer claims that both Jews and Jewish Christians were expelled as a result of their infighting. Claudius died around the year AD 54, and his successor, Emperor Nero, allowed the Jews back into Rome, but then, after the Great Fire of Rome of 64, Christians were persecuted. Fitzmyer argues that with the return of the Jews to Rome in 54 new conflict arose between the Gentile Christians and the Jewish Christians who had formerly been expelled. Keck thinks Gentile Christians may have developed a dislike of or looked down on Jews (see also Antisemitism and Responsibility for the death of Jesus), because they theologically rationalized that Jews were no longer God's people. A letter is something non-literary, a means of communication between persons who are separated from each other. Confidential and personal in nature, it is intended only for the person or persons to whom it is addressed, and not at all for the public or any kind of publicity...An Epistle is an artistic literary form, just like the dialogue, the oration, or the drama. It has nothing in common with the letter except its form: apart from that one might venture the paradox that the epistle is the opposite of a real letter. The contents of the epistle are intended for publicity—they aim at interesting "the public." Joseph Fitzmyer argues, from evidence put forth by Stirewalt, that the style of Romans is an "essay-letter." Philip Melanchthon, a writer during the Reformation, suggested that Romans was caput et summa universae doctrinae christianae ("a summary of all Christian doctrine"). While some scholars[who?] suggest, like Melanchthon, that it is a type of theological treatise, this view largely ignores chapters 14 and 15 of Romans. There are also many "noteworthy elements" missing from Romans that are included in other areas of the Pauline corpus. The breakdown of Romans as a treatise began with F.C. Baur in 1836 when he suggested "this letter had to be interpreted according to the historical circumstances in which Paul wrote it." Paul sometimes uses a style of writing common in his time called a "diatribe". He appears to be responding to a "heckler" (probably an imaginary one based on Paul's encounters with real objections in his previous preaching), and the letter is structured as a series of arguments. In the flow of the letter, Paul shifts his arguments, sometimes addressing the Jewish members of the church, sometimes the Gentile membership and sometimes the church as a whole. ... this epistle is the principal and most excellent part of the new testament, and most pure evangelion, that is to say glad tidings and what we call the gospel, and also a light and a way in unto the whole scripture ... The sum and whole cause of the writings of this epistle, is, to prove that a man is justified by faith only: which proposition whoso denieth, to him is not only this epistle and all that Paul writeth, but also the whole scripture, so locked up that he shall never understand it to his soul's health. And to bring a man to the understanding and feeling that faith only justifieth, Paul proveth that the whole nature of man is so poisoned and so corrupt, yea and so dead concerning godly living or godly thinking, that it is impossible for her to keep the law in the sight of God. This essay-letter composed by Paul was written to a specific audience at a specific time; to understand it, the situations of both Paul and the recipients must be understood. Paul's announcement that he is not "ashamed" (epaiscúnomai) of his gospel because it holds power (dúnamis). These two verses form a backdrop for the rest of the book. First, we note that Paul is unashamed of his love for this gospel that he preaches about Jesus Christ. He also notes that he is speaking to the "Jew first. "[1:16] There is significance to this, but much of it is scholarly conjecture as the relationship of Paul the Apostle and Judaism is still debated. We are hard-pressed to find an answer to such a question without knowing more about the audience in question. Wayne Brindle argues, based on Paul's former writings against the Judaizers in Galatians and 2 Corinthians, that rumors had probably spread about Paul totally negating the Jewish existence in a Christian world (see also Antinomianism in the New Testament and Supersessionism). Paul may have used the "Jew first" approach to counter such a view. Paul now begins into the main thrust of his letter. He begins by suggesting that humans have taken up ungodliness and wickedness for which there will be wrath from God. [1:18] People have taken God's invisible image and made him into an idol. Paul draws heavily here from the Wisdom of Solomon. He condemns unnatural sexual behavior and warns that such behavior will result in a depraved body and mind ("reprobate mind" in the King James Version) [1:26–27] and says that people who do such things (including murder and wickedness [1:29]) are worthy of death. [1:32] Paul stands firmly against the idol worship system which was common in Rome. Several scholars believe the passage is a non-Pauline interpolation. On the traditional Protestant interpretation, Paul here calls out Jews who are condemning others for not following the law when they themselves are also not following the law. Stanley Stowers, however, has argued on rhetorical grounds that Paul is in these verses not addressing a Jew at all but rather an easily recognizable caricature of the typical boastful person (ὁ ἀλαζων). Stowers writes, "There is absolutely no justification for reading 2:1–5 as Paul's attack on 'the hypocrisy of the Jew.' No one in the first century would have identified ho alazon with Judaism. That popular interpretation depends upon anachronistically reading later Christian characterizations of Jews as 'hypocritical Pharisees'". See also Anti-Judaism. In Romans 7:1, Paul says that humans are under the law while we live: "Know ye not...that the law hath dominion over a man as long as he liveth?" However, Jesus' death on the cross makes believers dead to the law (7:4, "Wherefore, my brethren, ye are also become dead to the law by the body of Christ"), according to an antinomistic interpretation. Paul goes on to describe how believers should live. Christians are no longer under the law, that is, no longer bound by the law of Moses, but under the grace of God, see Law and grace. We do not need to live under the law because to the extent our minds have been renewed, we will know "almost instinctively" what God wants of us. The law then provides an "objective standard" for judging progress in the "lifelong process" of our mind's renewal. To the extent they have been set free from sin by renewed minds (Romans 6:18), believers are no longer bound to sin. Believers are free to live in obedience to God and love everybody. As Paul says in Romans 13:10, "love (ἀγάπη) worketh no ill to his neighbor: therefore love is the fulfilling of law". One of the many politico-theological abuses of biblical statements is the understanding of Paul’s words [Romans 13:1–7] as justifying the anti-revolutionary bias of some churches, particularly the Lutheran. But neither these words nor any other New Testament statement deals with the methods of gaining political power. In Romans, Paul is addressing eschatological enthusiasts, not a revolutionary political movement. The concluding verses contain a description of his travel plans, personal greetings and salutations. One-third of the twenty-one Christians identified in the greetings are women. Additionally, none of these Christians answer to the name Peter, although according to the Catholic tradition, he had been ruling as Pope in Rome for about 25 years. Possibly related was the Incident at Antioch between Paul and Cephas. But by your hard and impenitent heart you are storing up wrath for yourself on the day of wrath when God's righteous judgment will be revealed. For he will render to every man according to his works: to those who by patience in well-doing seek for glory and honor and immortality, he will give eternal life; but for those who are factious and do not obey the truth, but obey wickedness, there will be wrath and fury. There will be tribulation and distress for every human being who does evil, the Jew first and also the Greek, but glory and honor and peace for every one who does good, the Jew first and also the Greek. For God shows no partiality. The gospel warned us, "Be on the watch for the last day, the day when the Son of Man will come," because it will spell disaster for those it finds secure as they are now – secure for the wrong reasons, I mean, secure in the pleasures of this world, when they ought to be secure only when they have dominated this world's lusts. The apostle certainly prepares us for that future life in words of which I also reminded you on that occasion. Let us not expect security while we are on pilgrimage. When we do find ourselves wanting it, what we are looking for is bodily sluggishness rather than personal security. Catholics would also look to the passage in Romans 8:13 for evidence that justification by faith is only valid so long as it is combined with obedient cooperation with The Holy Spirit, and the passage in Romans 11:22 to show that the Christian can lose their justification if they turn away from cooperating with The Holy Spirit and reject Christ through mortal sin. 2 For if Abraham were justified by works, he hath whereof to glory; but not before God. 3 For what saith the scripture? Abraham believed God, and it was counted unto him for righteousness. 4 Now to him that worketh is the reward not reckoned of grace, but of debt. 5 But to him that worketh not, but believeth on him that justifieth the ungodly, his faith is counted unto him for righteousness. 21 Thou therefore which teachest another, teachest thou not thyself? thou that preachest a man should not steal, dost thou steal? 22 Thou that sayest a man should not commit adultery, dost thou commit adultery? thou that abhorrest idols, dost thou commit sacrilege? 23 Thou that makest thy boast of the law, through breaking the law dishonourest thou God? 24 For the name of God is blasphemed among the Gentiles through you, as it is written. 25 For circumcision verily profiteth, if thou keep the law: but if thou be a breaker of the law, thy circumcision is made uncircumcision. Martin Luther described Paul's letter to the Romans as "the most important piece in the New Testament. It is purest Gospel. It is well worth a Christian's while not only to memorize it word for word but also to occupy himself with it daily, as though it were the daily bread of the soul". Luther controversially added the word "alone" (allein in German) to Romans 3:28 so that it read: "thus, we hold, then, that man is justified without doing the works of the law, alone through faith". The word "alone" does not appear in the original Greek text, but Luther defended his translation by maintaining that the adverb "alone" was required both by idiomatic German and Paul's intended meaning. This is a "literalist view" rather than a literal view of the Bible. 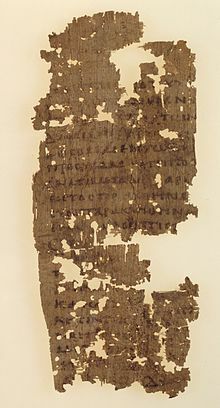 The Romans Road (or Roman Road) refers to a set of scriptures from Romans that Christian evangelists use to present a clear and simple case for personal salvation to each person, as all the verses are contained in one single book, making it easier for evangelism without going back and forth through the entire New Testament. The core verses used by nearly all groups using Romans Road are: Romans 3:23, 6:23, 5:8, 10:9, and 10:13. Romans has been at the forefront of several major movements in Protestantism. Martin Luther's lectures on Romans in 1515–1516 probably coincided with the development of his criticism of Roman Catholicism which led to the 95 Theses of 1517. In 1738, while hearing Luther's Preface to the Epistle to the Romans read at St. Botolph Church on Aldersgate Street in London, John Wesley famously felt his heart "strangely warmed", a conversion experience which is often seen as the beginning of Methodism. In 1919 Karl Barth's commentary on Romans, The Epistle to the Romans, was the publication which is widely seen as the beginning of neo-orthodoxy. ^ Felix Just, S.J. (2 September 2005). "New Testament Statistics: Number of Chapters, Verses, and Words in the Greek NT". Catholic-resources.org. Retrieved 18 September 2013. ^ Fitzmyer 1993, p. xiii. ^ "Finally, there are seven letters that virtually all scholars agree were written by Paul himself: Romans, 1 and 2 Corinthians, Galatians, Philippians, 1 Thessalonians, and Philemon. 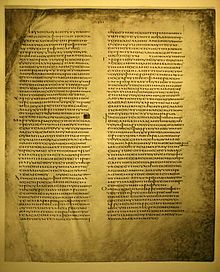 These 'undisputed' epistles are similar in terms of writing style, vocabulary, and theology. In addition, the issues that they address can plausibly be situated in the early Christian movement of the 40s and 50s of the Common Era, when Paul was active as an apostle and missionary." Bart Ehrman (2000, 2nd ed.). The New Testament: A Historical Introduction to the Early Christian Writings. ^ Bruce M. Metzger, A Textual Commentary on the Greek New Testament (2001), p. 477. ^ Ambrosius, Works, iii 373. Easton, Matthew George (1897). "Romans, Epistle to the" . Easton's Bible Dictionary (New and revised ed.). T. Nelson and Sons. ^ Geneva Study Bible on Romans 16:5, regarding the "church" (translated as "company" or congregation in some 16th-century translations) says: (b) The company of the faithful, for in so great a city as that was, there were different companies. Vincent's Word Studies (1886) on Romans 16:5 says: The phrase church that is in their (or his) house occurs 1 Corinthians 16:19, of Aquila and Priscilla; Colossians 4:15, of Nymphas; Plm 1:2, of Philemon. A similar gathering may be implied in Romans 16:14, Romans 16:15. Bishop Lightfoot says there is no clear example of a separate building set apart for christian worship within the limits of the Roman Empire before the third century. People's New Testament (PNT 1891) on Romans 16:5 says: . As the early Christians had no houses of worship, they met in the homes of prominent brethren. In the large cities there would be several such groups. One of these in Rome met in the house of Priscilla and Aquila. and PNT on verse 16:15 says: And all the saints which are with them. Probably another household church, which met with those just named. ^ Acts 18:1–2 "After these things Paul departed from Athens, and came to Corinth; 2 And found a certain Jew named Aquila, born in Pontus, lately come from Italy, with his wife Priscilla; (because that Claudius had commanded all Jews to depart from Rome:) and came unto them." Suetonius' Lives of the Twelve Caesars, Claudius XXV.4 "4 Since the Jews constantly made disturbances at the instigation of Chrestus,75 he expelled them from Rome." ^ Fitzmyer 1993, p. 77. ^ Fitzmyer 1993, p. 77 also argues that this may be what Paul is referring to when he talks about the "strong" and the "weak" in Romans 15; this theory was originally put forth by W. Marxsen, Introduction to the New Testament: An Approach to its problems (Philadelphia: Fortress, 1968) but is critiqued and modified by Fitzmyer. Fitzmyer's main contention is that Paul seems to be purposefully vague. Paul could have been more specific if he wanted to address this problem specifically. ^ Fitzmyer 1993, p. 69. ^ a b Fitzmyer 1993, p. 74. ^ s.v. "Romans, Letter to the"
^ for all of these comparisons see Ben Witherington's commentary on Romans, p. 63 which is available on a limited preview basis from Google books. ^ Percy Neale Harrison, Paulines and Pastorals (London: Villiers Publications, 1964), 80–85; Robert Martyr Hawkins, The Recovery of the Historical Paul (Nashville, TN: Vanderbilt University Press, 1943), 79–86; Alfred Firmin Loisy, The Origins of the New Testament (New Hyde Park, NY: University Books, 1962), 250; ibid., The Birth of the Christian Religion (New Hyde Park, NY: University Books, 1962), 363 n. 21; Winsome Munro, Authority in Paul and Peter: The Identification of a Pastoral Stratum in the Pauline Corpus and 1 Peter, SNTSMS 45 (Cambridge: Cambridge University Press, 1983), 113; John C. O'Neill, Paul's Letter to the Romans (Harmondsworth: Penguin Books, 1975), 40–56; William O. Walker, Jr., "Romans 1.18–2.29: A Non-Pauline Interpolation?" New Testament Studies 45, no. 4 (1999): 533–52. ^ These verses are commonly quoted to provide evidence of eternal security; however, groups who oppose eternal security state that this does not take into account the individual believer choosing voluntarily to leave Christianity. ^ "Blue Letter Bible". Blue Letter Bible. ^ Douglas J. Moo, The Epistle to the Romans (Eerdmans, 1996), 748. ^ Edward J Anton, Repentance: A Cosmic Shift of Mind and Heart (Discipleship Publications, 2005) 30. ^ Douglas J. Moo, Romans: The NIV Application Commentary: From Biblical Text to Contemporary Life (Zondervan, 2000), 399. ^ Douglas J. Moo, The Epistle to the Romans (Eerdmans, 1996), 756–758. ^ The Sword and the Ploughshare Romans 13:1–7 an Interpolation? ^ Paul Tillich, Systematic Theology, volume 3 (University of Chicago Press: 1963), p. 389. ^ For an authoritative discussion of the Catholic viewpoint, see Catholic Encyclopedia, s.v. "Epistle to the Romans"
^ Works, Expositions of the Psalms (121–150), 2004, New City Press, ISBN 1-56548-210-7 ISBN 9781565482104, Part 3, volume, 20, p. 446. ^ Luther, Martin. Concerning Christian Liberty. ^ Martin Luther's Preface to the Letter of St. Paul to the Romans cf. Luther's comments in his treatise on The Adoration of the Sacrament (1523) in which he refers to the words of institution of the Eucharist as being "the sum and substance of the whole gospel". Luther's Works, American Edition, St. Louis and Philadelphia: Concordia Publishing House and Fortress (Muhlenberg) Press, vol. 36 (Word and Sacrament II (1959)), , p. 277. ^ Martin Luther, On Translating: An Open Letter (1530), Luther's Works, 55 vols., (St. Louis and Philadelphia: Concordia Publishing House and Fortress Press), 35:187–189, 195; cf. also Heinz Bluhm, Martin Luther Creative Translator, (St. Louis: Concordia Publishing House, 1965), 125–137. ^ Swan, James. "Luther Added The Word "Alone" to Romans 3:28?". February 05, 2006. Retrieved 29 March 2014. ^ What is the Romans Road to salvation?, from Got Questions? Bruce, F. F. (1983). The Epistle of Paul to the Romans: An Introduction and Commentary. Tyndale New Testament Commentaries. Leicester, England: Inter-Varsity Press. ISBN 0851118550. Dunn, J. D. G. (1988a). Romans 1–8. Word Bible Commentary. Dallas, Texas: Word Books, Publisher. Dunn, J. D. G. (1988b). Romans 9–16. Word Bible Commentary. Dallas, Texas: Word Books, Publisher. This article incorporates text from a publication now in the public domain: Easton, Matthew George (1897). "Romans, Epistle to the" . Easton's Bible Dictionary (New and revised ed.). T. Nelson and Sons. Fitzmyer, Joseph A. (1993). Romans: A New Translation with Introduction and Commentary. Anchor Bible. New York: Doubleday. Stuhlmacher, Peter (1994). Paul's Letter to the Romans: A Commentary. Westminster: John Knox Press. ISBN 0-664-25287-7. Look up πίστις in Wiktionary, the free dictionary. "Bible Gateway 35 languages/50 versions"